Following the first trailer that debuted back in July, Paramount Pictures has unveiled the second trailer for The Spongebob Movie: Sponge Out of Water, along with a new poster. After spending his entire life under the sea in the Bikini Bottom Gulch, Spongebob (voiced by Tom Kenny), Patrick (Bill Fagerbakke) and the rest of their friends go on a quest to find the stolen recipe for their Krabby Patty burgers, which brings them into our world, where they encounter a nefarious pirate named Burger-Beard (Antonio Banderas). 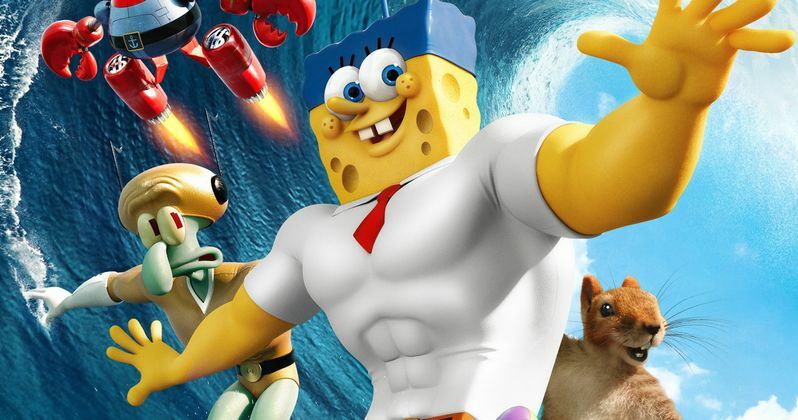 Clancy Brown, Thomas F. Wilson, Rodger Bumpass, Carolyn Lawrence and Mr. Lawrence round out the voice cast for this live-action/CGI hybrid from director Paul Tibbitt (The SpongeBob SquarePants Movie), which arrives in 2D and 3D theaters nationwide February 6, 2015.